Help The Wedding Wishing Well Foundation this Christmas, simply by shopping. By accessing your favourite retailers via EasyFundraising (easyfundraising.org.uk), you will receive a cash reward every time you shop. This can be turned into a donation for The Wedding Wishing Well Foundation, at no extra cost to yourself – it really is that simple. With over 2,700 online retailers to choose from, including Amazon, John Lewis, Argos, eBay, and Marks and Spencer, there has never been an easier way to donate to us. We are hoping to make 2015 our best year yet, and couldn’t do it without your continued support. To find out more, and to register, please click here. We are excited to bring you details of this year’s twobirds sample sale, which will once again be raising funds for The Wedding Wishing Well Foundation. Offering a variety of great styling options, twobirds dresses are a fantastic option for your bridesmaids; visit their website for a peek at the many looks you and your maids will be able to create. Their sample sale provides the chance for you to purchase a beautiful twobirds gown with up up 40% discount – an opportunity not to be missed! Not only that, but a £2 entrance fee will be donated to the Foundation, helping us to continue our work. The sale will be held at the twobirds flagship store in Covent Garden on 19th and 20th November, from 10.30am-8pm (last entry 7.15pm). No appointment necessary but there may be a queue at busy times to enter. Is there an an entry fee? There will be a £2 entry fee per person which will be donated to The Wedding Wishing Well Foundation. Which dresses will be available? The sample sale will be made up of a selection of our old shop samples which have been used, new dresses in discontinued colours, slightly damaged but perfectly wearable fabric and dresses in colours where we have reached the end of rolls of fabric. There may be multiples in some colours and we will have a range of colours available. All dresses will be of wearable quality and some of them new. Please note that we will not have full details until two days before the sale of which dresses will be available but there will be a wide selection of colours and styles in the classic collection so it is well worth an early visit to grab a bargain. Please note that all sales are final. Will there be a range of sizes available? Yes, there will be a mix of size A (UK4-16) and size B (UK18-24) dresses available in various lengths. Will there be matching bandeaus? Matching bandeaus will be available in some colours on the day or for purchase for collection/delivery after. Can my bridesmaids try the dresses on? There will not be a specific changing area but it will be possible to briefly try the dresses to check length and size. Will you show us how to tie the dresses? The sample sale is likely to be very busy so we wont be able to accommodate individual styling. We will be available to advise on size/length as required. There are video tutorials on our website for all the styles so you can have fun practising with your girls at home. Can we attend a twobirds styling evening? Our styling evenings at always at capacity in the busy season and slots are therefore reserved for brides purchasing full price dresses. Will there be any men’s accessories in the sample sale? We have a small range of men’s accessories at discounted rates and there will be swatches of other selected colours available which can be ordered with our standard lead-time of 6 weeks. You can pay with cash or on a credit or debit card. Please note that we cannot accept cheques. Because the dresses are samples, it’s preferable that you see them before purchasing but we can take some orders over the phone subject to the availability of the team and we will do our best to describe the condition of the dresses accurately. During busy times it may not be possible to take phone orders. So, get your favourite girls together and come and grab yourself a bargain! 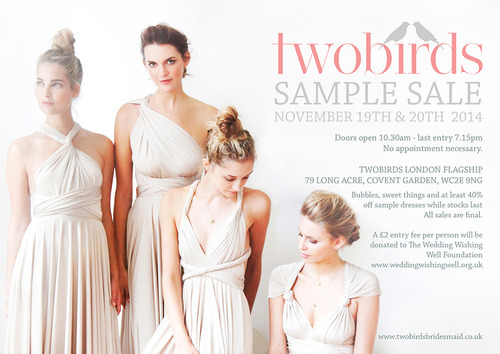 Last year’s sample sale raised a brilliant £260 for The Wedding Wishing Well Foundation, so we’re incredibly grateful to be supported by twobirds once again.